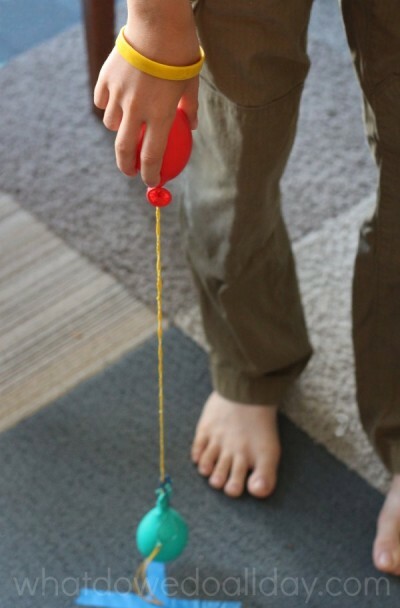 A standard Yo-Yo can be tricky for kids, and nearly impossible for really young kids to learn. These easy-to-make balloon yo-yos on the other hand, are loads of fun and will cause lots of laughter (and maybe a little mayhem). Since we are apartment dwellers, one of the main themes of my blog has been keeping kids busy with indoor activities. I’m all for letting the kids entertain themselves, but practical parents know that boredom busters come in very handy. The clever minds, Holly Homer and Rachel Miller, behind the popular blog, Kids Activities Blog, have just released a great gift for parents in need of a fun idea to share with their kids. Their book, 101 Kids Activities That Are the Bestest, Funnest Ever! : The Entertainment Solution for Parents, Relatives & Babysitters! , is chock full of ideas that are easy, entertaining and educational. However, my favorite quality of all the activities is that kids can always take the lead and make the activities their own. That is exactly what happened when I made these balloon yo-yos for the boys. Now, I know you are thinking that balloon yo-yos are dangerous things to give to boys indoors. To that I say… well, yes…. and no. 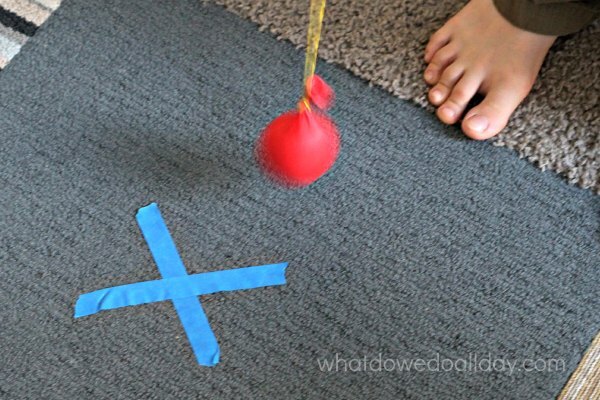 You already know I’m not afraid of playing ball games indoors, so it won’t surprise you that I allowed my boys to test drive a balloon yo-yo in our small living room. The instructions in 101 Kids Activities That Are the Bestest, Funnest Ever! 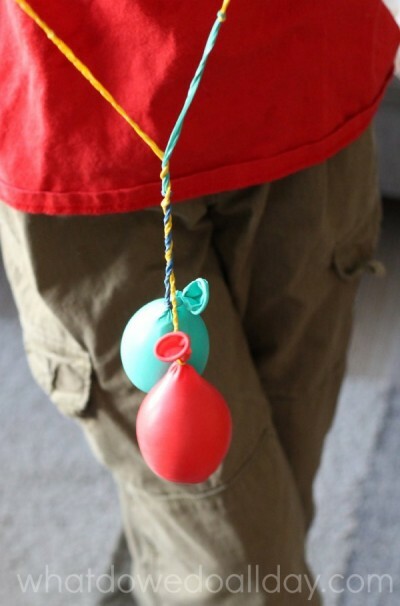 for how to make a balloon yo-yo are simple. Fill up a balloon with play dough, flour or beans. 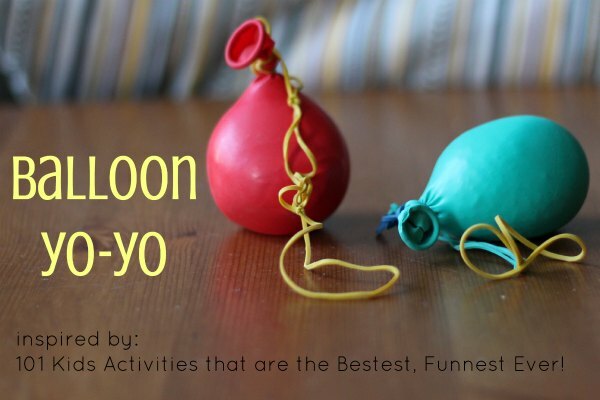 Make a chain of rubber bands and secure to the ballon to create the yo-yo “string.” I used a funnel to fill the balloons with flour and rice. After tying the balloon closed, I carefully slipped it inside a second balloon and knotted the top again. Initially I gave them only to my 9 year old. I placed an X on the carpet as a target, as suggested in the book. After a few tries bouncing the balloon to try and hit the X, he discovered what he really liked to do was swing the two balloons in a circle and twist them up and down. He even used one balloon as a sort of handle to control the other. When my 5 year old arrived home and saw the fun the first words out of his mouth were, “Where’s mine? I want one.” After that it was a bit chaotic, what with the two of them swinging the balloons around like wrecking balls and, yes, I insisted my husband take both boys and both balloon yo-yos outdoors. So, you see, there is a limit to the mayhem I will allow inside. So, the verdict is: Balloon yo-yos are awesome fun. If you have two or more children, take them outdoors. Well, unless you have one of those huge playrooms I understand exist outside of NYC. For more super groovy ideas to keep your kids busy indoor AND out, I highly recommend checking out Holly and Rachel’s book, 101 Kids Activities That Are the Bestest, Funnest Ever! After all, summer is here and there are a lot of empty days to fill. So cool! I would love it if you joined and contribute your awesome posts at my link party at City of Creative Dreams, starts on Fridays 😀 Hope to see you there at City of Creative Dreams Link Party.